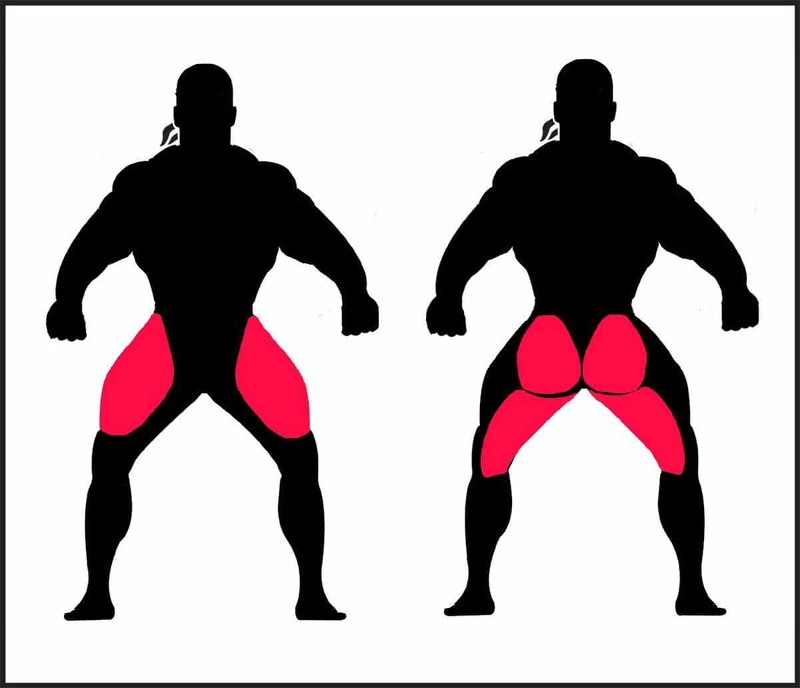 The squat is one of the two major lower body exercises, the other being the deadlift. Whereas the deadlift has a greater emphasis on your glutes, hams and posterior chain, squats have a greater emphasis on the quads. Both work the entire lower body. Although a lower body lift, squats work the majority of your muscular system, can significantly tax your central nervous system as well as your cardiovascular system. Your strength training program is not complete without some squat variation. Squat rack – you will be lifting too much weight to lift onto your shoulders. Set the rack height at mid to upper chest height so that you will have good leverage to unrack and walk the weight out. Set the safety pins low enough so that you can squat to full depth without bumping them, and high enough so that they can catch the bar if you get into trouble. If you can, set up the squat rack so that you can face away from the mirror. Your motion in the mirror can distract you, causing your form to falter. T-Shirt – for squatting use a relatively tight t-shirt. The bar will be less likely to slide on a t-shirt than on your bare skin (ie a tank top), and a tight t-shirt will keep the shirt from sliding between the bar and your skin. For additional stability, run chalk along your back and shoulders where the bar rests. Shoes – lift in shoes with a solid sole. Running or athletic shoes have soles that will compress under the weight of your body and the bar, greatly decreasing your stability. Bar Placement: Demonstrated here is the low bar position. This will give you good leverage for maximum power. The bar should rest on the back of your delts at the base of your traps. If you slide the bar down your traps as you step under it, you will find a groove between your delts and traps the bar slides right into. Note: there are other bar placement options based on training goals and body mechanics – alternate bar placement is beyond the scope of this article. Hand Placement/Grip: Grip the bar as close to your shoulders as your flexibility will allow. Moving your hands out wider, away from your shoulders will reduce tension on your shoulders and elbows, if you lack flexibility, but it will loosen your upper back, reducing your stability. Conversely, bringing your hands in will tighten your upper back, increasing your stability. A wider stance increases emphasis on your hips, reduces tension on your glutes and hamstrings, and can make it more difficult to hit full depth. A wide stance also reduces the range of motion of the squat. Rotating your torso as a solid unit, drive your hips forward under the bar. Lift the bar straight up out of the rack using strong leg/quad drive (I call this the quad pop – the bar should pop right out of the rack). Watch your feet as you walk out, to ensure correct placement. Take at least two, but no more than three short, quick steps back from the rack to set up. I prefer to take one foot straight back, move the other back into the lifting position, then move the first over into lifting position. The fewer and shorter steps you take, the less energy you will expend. Depth: Proper squat depth depends on a number of variables. If you are a competitive powerlifter, every squat rep should be below parallel. The top of your thigh at your hips should be below the top of your knee. To build muscle mass, you will get maximum hamstring activation at parallel. To maximize glute activation, you should squat 1-2″ below parallel. It is possible to squat too deeply. If you lack flexibility, and your lumbar bar spine begins to flex as you reach parallel, and your buttocks tuck under, limit your squat depth to the point where the tuck begins – until you can improve your mobility. Drive the weight back up explosively. Keep your head and chest up and drive down through your heels to maximize the use of your hamstrings and glutes. Force your knees out as you begin the drive and through the lift, this will prevent them from collapsing in, and will help you increase hip drive. Complete the lift by locking out your knees, squeezing your glutes to force your hips forward and bringing your back fully erect. Exhale once you pass the sticking point and through lock out. Come to a complete stop, fully locked out before beginning the next repetition or racking the weight. Begin the next rep by taking another full breath of air and blocking. Partial squats: performing squats without descending at least until your thighs are parallel with the floor reduces the effectiveness of the exercise. Reduce the bar to a weight you can control through the full range of motion. Leaning forward: leaning forward will make it more difficult to squat to proper depth, will reduce the workload on your legs, and increase the tension on your lower back. Allowing your knees to buckle in: don’t let your knees buckle inward during the lift; this puts unnecessary strain on your knees; forcing your knees out as you lift gives you greater stability and power. Pointing your toes ahead and not driving your knees out will push your hips back, this will make hitting depth more difficult. Pointing your toes out and driving your knees out will make hitting depth less difficult. 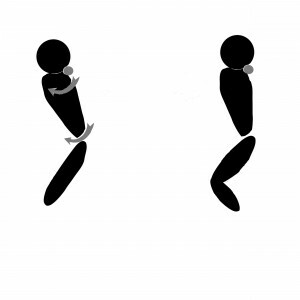 Above 2 pictures: Forcing your knees out allows you do drop right into the hole! Rounding your back: keep your back flat throughout the lift. Taking too much time to set up: set up quickly and methodically to get into the squat position; the longer your setup takes with the weight on your back, the less weight you will be able to squat. Always use a spotter when squatting. Make sure your spotter knows how to properly assist you if you get into trouble. Perform your squats in a squat rack or cage with safety bars for added safety. Before starting, make sure the safety bars are set properly for your height. You should be able to complete a full squat without touching the bars, but with the barbell on the safety bars you should be able to easily get out from underneath the barbell. Perform your squats with proper form. Use weights that you are able to control each repetition with strict form. Performing squats with a weight that is too heavy to perform correctly can lead to injury. Keep your back flat. Don’t let your lower back round. High bar squats: placing the bar on your traps versus delts can increase the tension on your quads, and can effectively create hypertrophy to build leg size.